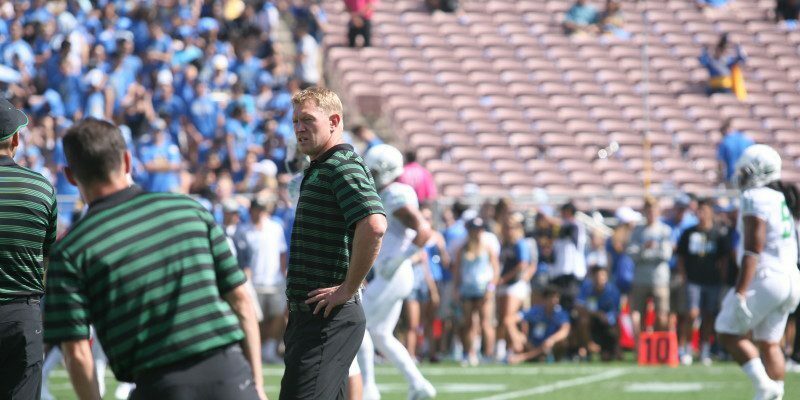 In an interview for FishDuck.com on Wednesday, I spoke with Oregon’s offensive coordinator Scott Frost at the Hatfield-Dowlin Complex. The Ducks initiated spring practices last week, and while they’ve only been back on the gridiron for a few days, coaches have seen quick and precise improvements amongst the players. Frost has enjoyed working with the new faces on the offensive line and he believes that the running backs have excelled in practice, as well; however, with the NFL Draft right around the corner, the Ducks’ offensive coordinator chimed in on some of the national misconceptions about Marcus Mariota. Frost also mentioned that Mariota’s athletic and throwing abilities will allow him to thrive under any NFL system. No one has ever really downplayed Mariota’s accomplishments at Oregon. The Ducks’ Heisman winner had a legendary run during his time in Eugene, but the biggest concern has been whether or not Mariota can succeed in a pro-style offense. There’s no doubt that Mariota’s successor will have tough shoes to fill next season, and with various different quarterbacks fighting for the coveted position, Frost believes that Jeff Lockie, who many consider to be the front runner for the starting quarterback job next year, is ready and willing to learn. The Ducks will return to the practice field this Friday.